On this day, 80 years ago, the Spanish Civil War came to an end with the victory of Franco's alliance of Nationalists, Monarchists and Catholics. The opinion pages of the French centrist daily Le Monde carry an article headlined “Spain and France still owe Franco's victims an apology”. The basic fact is that, following the Nationalist victory, hundreds of thousands of men, women and children, both former fighters and civilians, were forced to leave Spain as Franco's forces spread what the article calls the “black veil” of fascism over the Iberian Peninsula. 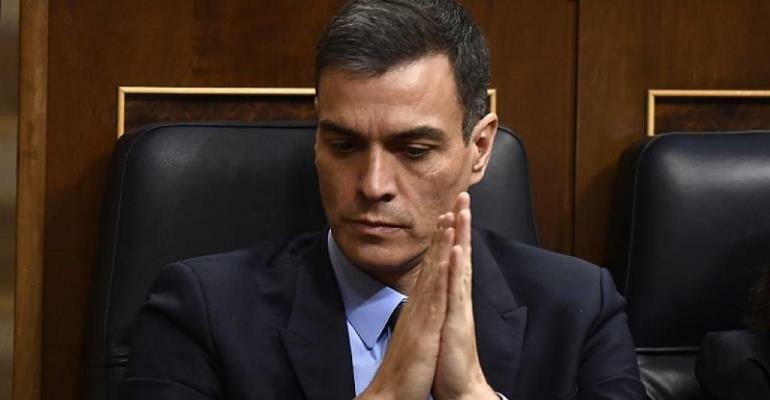 Last month the Spanish Prime Minister, Pedro Sanchez, asked for forgiveness from all those involved in the so-called retirada or retreat – the forced exile of the defeated and their families. That official recognition was eighty years in the making. Sanchez made his symbolic gesture at a crucial time, says the Le Monde article. And his eloquent plea was for a recognition of the republican spirit in Spanish democracy. Recent years have seen a concerted effort by many right-wing elements in Spain to paint over the excesses of the Franco dictatorship. Let no one forget, asserts the French daily, that the collective madness of that fratricidal war was sparked by a military coup against the legitimately elected, but left-wing, Popular Front government. Pedro Sanchez spoke only after having visited the French graves of two of the most famous exiles: Manuel Azaña and Antonio Machado. Both poets, writers and ardent anti-fascists, they head a long list which gives an idea of the huge intellectual loss suffered by Spain at the time of the retirada . The fight against fascism enforced the unification of all left-wing forces. Sanchez was careful to reassign each of them their place, without obliterating their differences. Le Monde points out that the so-called democratic transition between 1976 and 1982 was really an occasion for the winners of the civil war to maintain their pressure on the losers. The amnesty proclaimed in 1977 put both sides on an equal footing, meaning that the crimes of the dictatorship were officially absolved by an appalling silence. And also meaning that there was no chance of justice for the children and grand-children of those who had fought on the losing side. Le Monde says that Spain can never be a true democracy as long as the country's roads and footpaths are bordered by the unmarked graves of unidentified corpses, or while plaques and statues commemorate the glories of the Franco regime. Perhaps even worse for ultimate social cohesion is the fact that none of the cases condemning anti-Franco resistance fighters have ever been officially declared void by the Spanish courts. But how many French people know how the Spanish refugees were treated once they had crossed the Pyrenees? How many realise the appalling conditions under which they were held in internment camps in the south of France? In 1936, the Paris government chose to turn a blind eye to the Spanish tragedy. After the 1939 defeat, the refugees were either treated like animals, or encouraged to return home, or to join the Foreign Legion, or to work in foreign labour camps. When the world war ended, they were forgotten or considered “unwelcome”. The world had to wait until 2014 before a French president could be heard publicly admitting the importance of the role played by Spanish exiles in the liberation which ended the Second World War. Acknowledging the truth of History involves accepting responsibility, says Le Monde. And the fact is that, in this case of the Spanish refugees at least, France showed a failure of courage. Now, 80 years after the tragic events, would be a good time to begin the process of truth and reconciliation. There is a letter-box on the tomb of Antonio Machado in the French town of Collioure. Letters are sometimes posted there by the descendants of exiled Spanish republicans. Just as their fathers and grand-fathers have done over the past eight decades. It is time, says Le Monde, for the French government to write its own letter of apology. Antonio Machado is still waiting.